The above map shows which states are legal for individuals to own suppressors. Click here to download the ATF Form 4. Click here to go to the ATF eFile service. 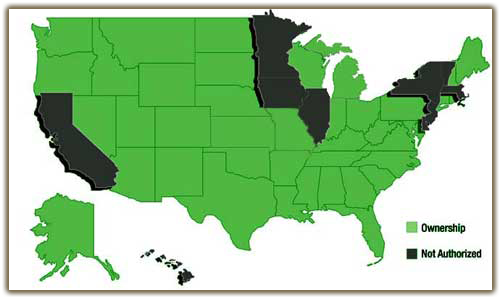 You are a legal U.S. resident, 21 years of age or older, a non-felon, and live in one of the 39 states that allow private ownership of suppressors – see green states on map. Stryker Enterprises LLC has pdf files of the required forms linked above. Include TWO 2″X2″ photographs of your face. Commonly referred to as a passport photo. Please feel free to ask questions. Stryker Enterprises LLC is committed to making your buying experience a pleasant one.